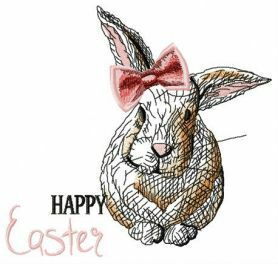 Celebrate the happy and glorious Easter holidays and decorate your home and presents for your loved ones with this amazing machine embroidery design! It features an adorable bunny, a traditional Easter symbol. 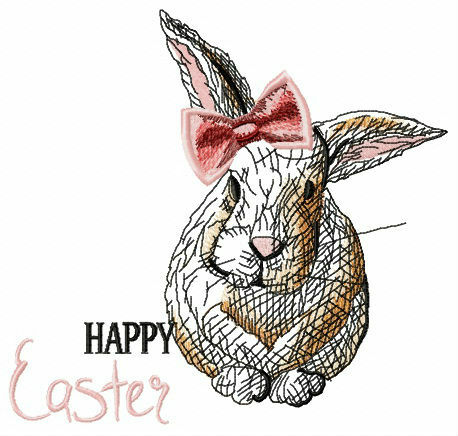 A pink bow is tied around one of its ears to give the bunny a festive look. This unusual needlework comes in a color palette of flesh, pumpkin, desert bloom, tuxedo red, burgundy, bitteroot and black. Stitch it out to decorate all sorts of things, ranging from towels, bathrobes, pajamas and sweaters to tablecloths, napkins, cushions, blankets and quilts. Works with most fabrics. DOwnloaded the easter bunny to my embroidery collection, I'd surely use it for Easter gifts! Tested already on a cotton patch, turned out very nice. Great purchase I think. Getting ready for the Easter! I fall in love with the rabbit! Embroidered several napkins with the design and with easter chicken, perfect things went out! I will present the set of napkins to my mother-in-law. Great purchase! !